Dr. Cobb offers a variety of workshops exploring songwriting, music production, and music video production. Using project and inquiry-based learning as a departure point, students delve into topics of interest and concern multimodally, generating test, imagery, and music. ​Below are examples of songs created with elementary and high school students. The one day songwriting challenge is designed for groups of five to ten students and requires approximately one full school day to complete. Using concept maps and free writes, students generate lyrics based on a topic of interest or even a subject explored within existing school curricula. Dr. Cobb works in GarageBand with students to generate a backing track of sounds chosen collaboratively and then simple raps and/or melody lines are created to add to the GarageBand session. Dr. Cobb completes the project by recording the vocals with students and mixing/mastering the final composition. This track may then be used as the departure point for a music video production project in subsequent workshops with Dr. Cobb. Below is an example of a song created by 8 elementary school students in a five hour songwriting challenge. The song, entitled "Stand Up Girls" explores gender roles and self empowerment. Songwriting workshops with larger groups of students are designed to accommodate full classes or groups of twenty to thirty students and requires approximately five sessions of 60 to 90 minutes to complete. Using concept maps and free writes, students generate lyrics based on topics of interest or existing school curricula. Dr. Cobb works in GarageBand with students to generate a backing track of sounds chosen collaboratively and then simple raps and/or melody lines are created to add to the GarageBand session. Dr. Cobb completes the project by recording the vocals with students and mixing/mastering the final composition. This track may then be used as the departure point for a music video production project in subsequent workshops with Dr. Cobb. Below is an example of a song created by a class of elementary school students in a five session songwriting workshop. The song, entitled "We are All Better Living as One" explores the relationship between the kelp forests in the ocean and the life cycle of otters. This is a working version of the lyrics generated with the students - based on class materials and work books exploring the life cycles of the otter and kelp forests of the Salish Sea. 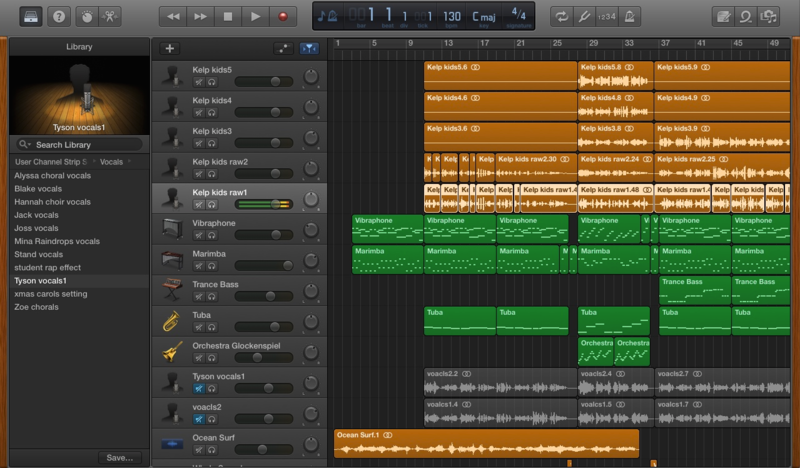 This is a screen capture of the GarageBand session which includes the music and vocal tracks.